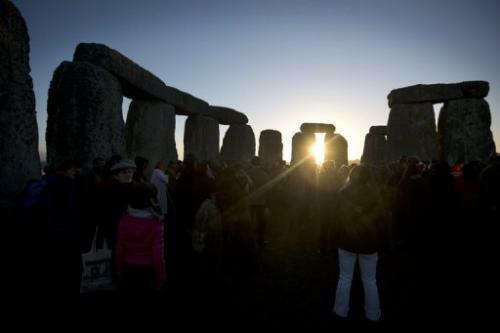 Revellers celebrate the pagan festival of 'Winter Solstice' at Stonehenge in Wiltshire in southern England on December 21, 2012. "In many ways our findings are rewriting the established story of Stonehenge," Parker Pearson said. These would have been attended by up to one tenth of the British population at one time in what Parker Pearson said resembled "Glastonbury festival and a motorway building scheme at the same time." "Stonehenge was a monument that brought ancient Britain together," he said. "What we've found is that people came with their animals to feast at Stonehenge from all corners of Britain—as far afield as Scotland." He said it appeared to be the "only time in prehistory that the people of Britain were unified." Unesco describes Stonehenge as the most architecturally sophisticated prehistoric stone circle in the world. But archaeologists have long argued about its importance to the people who built it, ranging from a place of astronomy to one of human sacrifice. The researchers said their findings also gave a clue to why the monument stopped being used—another mystery that has baffled archaeologists.